Soompi.com is the world’s biggest English-language online community dedicated to Korean pop culture. It boasts some 1.4 million visitors daily. More importantly, 90 percent of its members are non-Koreans. The website is widely regarded as a promising social network venture that has secured a solid user base on the strength of Korean cultural content. Softbank of Japan has already invested in Soompi.com and other investors are lining up amid the outlook that the website will emerge as a key gateway to Asian pop culture for English-speaking audiences. As for Hallyu, Kim noted that the near absence of a legitimate distribution of Korean pop content is a serious problem that is often neglected by Koreans. The following are excerpts from the e-mail interview with Kim. Korea Herald: How did Soompi.com start, and how did you get involved in the site? 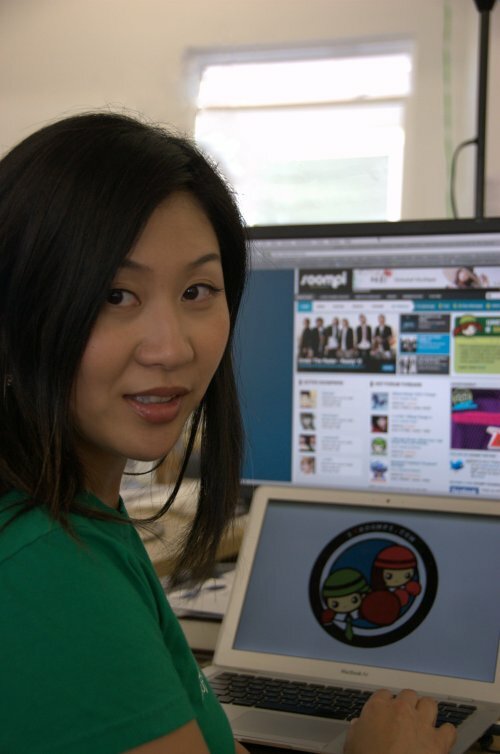 Joyce Kim: Soompi was started by my co-founder Susan Kang in 1998 as her own personal website dedicated to her interest in Korean dramas and music. During the initial first few years, Susan would scan Korean entertainment magazine articles, translate them into English and post them on the site. Slowly, a community began to grow around the site and Susan soon had people volunteering to help with the site. As the first Hallyu wave began to grow, the site also began to grow. Soon, there were hundreds of thousands of visitors each month. I met Susan because she is the older sister of my best friend from law school. We initially started to work together on Soompi in 2006 when the site growth was really taking off which meant server expenses were also taking off. I was helping Susan set up the advertising system on the site and eventually we decided to officially create a company and work on Soompi together. At first, we both kept our full-time jobs (Susan as a coder and me as a lawyer) and worked on Soompi during our nights and weekends. But by the end of 2008, the site was so active that it was obvious that the site needed more support. We made the decision to leave our jobs in 2009 and work on Soompi full-time. KH: If you define Soompi.com, what is it? Kim: Soompi is an online fan community for Hallyu. Soompi’s greatest strength lies in our members. Ninety-nine percent of the content on Soompi is user-generated content so our members are the ones who find the information to share and discuss. They spend a great deal of time online answering each other’s questions. No amount of money or marketing can create the organic community that sites like Soompi have. KH: Who are Soompi members? Kim: Soompi members are mostly young Americans of many different backgrounds (Asian, Caucasian, black and Latino) followed by people in their teens and 20s in South East Asia (Singapore, Philippines, Indonesia, etc). They are typically very fashionable and up on the latest trends since they follow entertainment so closely. When they come to Soompi, they are often looking for the latest news about Hallyu and to meet other passionate fans. Hallyu fans love to work together to do events and share their love for their idols. KH: What aspect of Hallyu appeals to Soompi members? Kim: Soompi members love the celebrities ― their personalities, their visuals, their songs ― all of it. In fact, many of our members (90 percent of whom are not Korean) have started to learn Korean to better understand the music and dramas. Hallyu has definitely started to grow beyond its typical Asian boundaries. I think we will see Hallyu spread to the U.S., Latin America and Europe in 2011. However, for Hallyu to be truly successful abroad, Korean entertainment companies need to better understand international fans better ― this is important for creating new fans and reaching out to new markets. KH: What can Korean websites and firms interested in Hallyu learn from Soompi? Kim: I would say two differences between Soompi and Korean sites are 1) we really take into consideration the community’s desires when we build new products ― meaning oftentimes we look at community feedback first when thinking about new features and 2) we push out features before they are 100 percent perfect ― sometimes it means it has bugs, but it also means we can get our full community reaction quickly and fix or change things as needed. For entertainment firms working in the Hallyu industry, it is important to make the music and drama content easily available for international fans. People in Korea do not realize how hard it is for international fans to buy the music and dramas legally ― there are not good options available. If entertainment firms made their content for easily available for international purchase, then more international fans would buy the content. But at the moment, we cannot even easily register on Korean websites. KH: To create new and successful services based on social network service, what should and shouldn’t Korean venture startups do? Kim: I see many Korean startups that are testing or half-heartedly targeting the global market. The decision whether to go global should be made early as it significantly impacts the kind of team that needs to be built and the product. If you are building an SNS service targeting the international market, then you should create your team abroad. KH: What was the purpose of your latest visit to Seoul, and what did you feel when you were in Seoul? Kim: I visit Seoul at least once a year to meet with Korean entertainment companies and Korean Internet startups. On the entertainment front, there is strong interest in online and social media strategy from the entertainment companies. This is one of the big growth opportunities for Hallyu. But I think Korean entertainment companies will need to hire people with international Internet experience to really open that opportunity.